Friends have been praised for attempting to save the life of a dad who severed an artery when he punched a car windscreen. Marcus Butler and Chelsea Gibbon rushed to Carl Thorpe’s aid as he lay dying in the road, an inquest into his death was told. The 27-year-old had been on a night out with the mother of his three children, Shelly Sockett. Doncaster Coroner’s Court heard Mr Thorpe became ‘worked up’ about a group of men from Skellow and punched the car window in Instone Terrace, Askern, severing the main artery in his right arm. Miss Gibbon and Mr Butler, who did not have working mobile phones, attempted to attract the attention of nearby residents, shouting: ‘Someone needs to phone an ambulance’. As the pair asked a resident for help, Mr Thorpe ‘wandered off.’ He was found minutes later curled up in a ball on a doorstep. 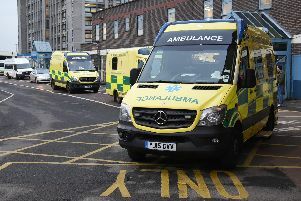 Two neighbours tried to resuscitate the labourer, of Alfred Road, Askern, who had gone into cardiac arrest, as another tried to stem the bleed by using a towel as a tourniquet. When paramedic Claire Windspear arrived they continued to try and resuscitate him as she attempted to restart his heart. She said: “When I arrived he had stopped bleeding. It was clear he had already lost most of the blood from his body. Mr Thorpe was taken to Doncaster Royal Infirmary following the incident in the early hours of July 20, but was pronounced dead. He died from severe shock caused by blood loss. The court heard prior to the incident Mr Thorpe had drunk half a bottle of vodka at his mother’s house. He had been to the White Heart and Red Lion pubs in Askern. Coroner Nicola Mundy recorded a verdict of accidental death.